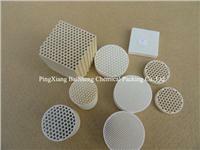 It"s widely used in gas radiant heaters and plays the most important part in those applications. The interlaced corrugated surface of the ceramic tile combined with honeycomb design basis provides a superb surface area and working burning surface. We have also adopted the best raw material and new formula to maximize the micro-porosity of the tile. With all these advantages, the oxygen mix completely with the gas, burning without flame, emitting high efficiency far infrared ray and radiant heat, saving up to 40%-50% energy cost.